Have you ever made corned beef from scratch? I’m not talking about those plastic-sealed pink pouches in the grocery store. I mean, really homemade corned beef. 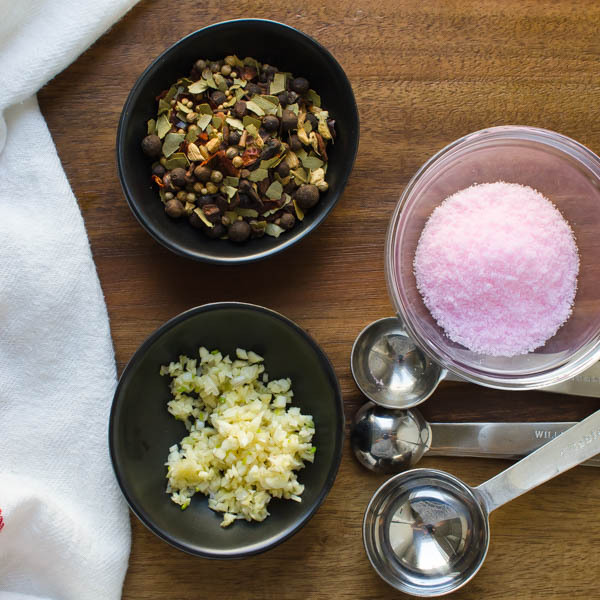 How about making your own corned beef brine? It’s simpler than you think and the beef brine recipe only requires a handful of ingredients and a little patience. 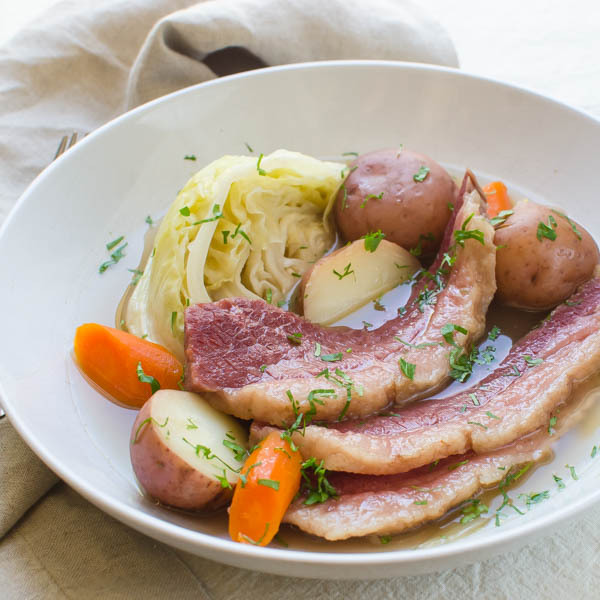 Corned beef and cabbage is arguably THE traditional St. Patrick’s Day meal and one that my family enjoyed every March 17th. So you’d think I’d have a few corned beef from scratch options for you on this site, but when I looked back through my “St. Patty’s” posts I found recipes like lamb stew, stout braised chicken, stout beef carbonnade, corned beef hash, a tasty Irish banger skillet even a luscious stout caramel sauce. All very good, however, I was shamefully lacking the most obvious recipe. I know why. 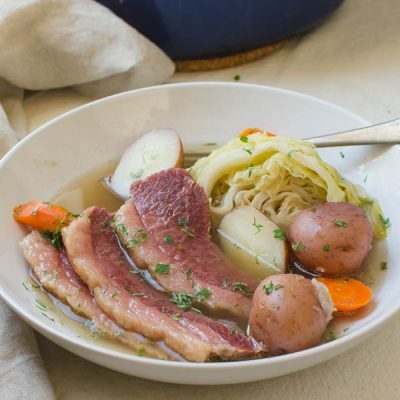 Corned beef is kind of a no-brainer… you buy the package of bright red beef at the market, stick it in your crock pot with vegetables and that special “pickling packet” and let it simmer until the beef and vegetables are tender. That’s when I realized — I’d never made corned beef from scratch. Until now. 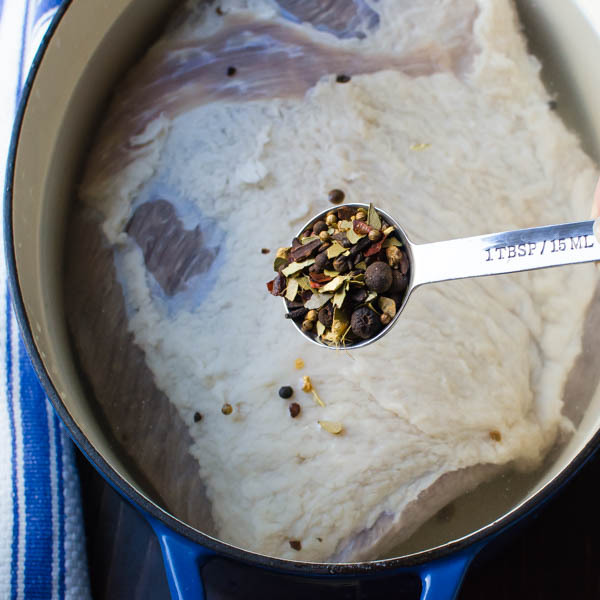 If you’ve ever wondered how to make your own corned beef brine, you’ll be surprised at how straightforward it is. The only ingredient you might not be familiar with is the Instacure, but we’ll get to that in a second. Salt – (Morton’s Kosher salt — do not use Crystal because the weight and flake size are different and it would be very easy to oversalt the meat). Instacure or Prague powder is a curing mixture of 93.75% table salt and 6.25% sodium nitrate. Salt acts as a preservative and through the process of osmosis, it not only pulls the water out of the cells of the meat it also pulls out any bacteria and kills it. 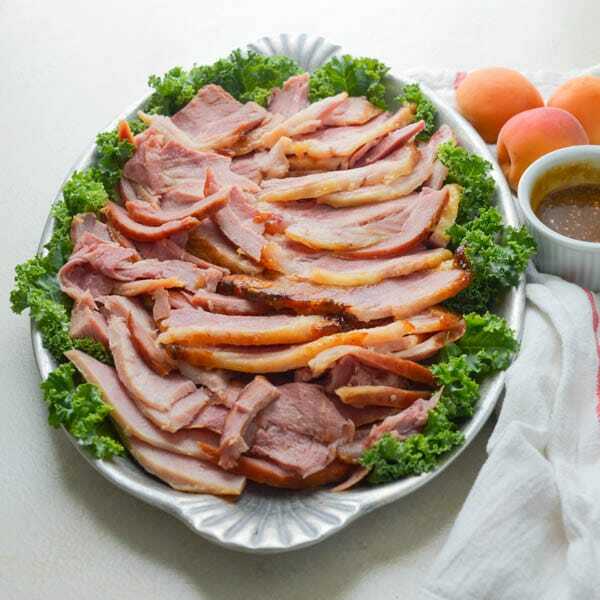 Sodium nitrate prevents the growth of bacteria, so this double whammy will keep this traditional St. Patrick’s Day treat a safe meal to enjoy. The pink coloring is added so that it won’t be confused with table salt, but that color is also responsible for giving our corned beef it’s distinctive hue. To make the beef brisket brine, pull out a large stock pot and combine all the ingredients, right down to the pickling spice. Simmer on the stove until the salt, sugar and Instacure are dissolved. Let the corned beef brine cool to room temperature. When the mixture is cold, you’re ready to begin the brining process. What Do I Put The Brine & Brisket In? Probably the most difficult part is finding a receptacle large enough to hold the gallon of corned beef brine and the five pound beef brisket. I pulled out all of my containers, pots, tupperware — YOU NAME IT, but they were all insufficient. So, I made an investment at a restaurant supply house. (Click on the photo for affiliate link to product). This plastic container with lid holds 12 quarts. Plenty of room for my brisket and the corned beef brine (or a turkey, or ham). Don’t worry, it’s gonna get used. You could also use an extra large stock pot like this one. (Click on the photo for affiliate link to product). Place the brisket in whichever container you choose and add the beef brisket brine. Seal it up and refrigerate for 5 days, turning every day or so to make sure it’s getting good coverage. Rinse the brisket under cold water. Discard the corned beef brine. Place the brisket in a dutch oven (can also use a crock pot or Instant Pot according to manufacturer’s instructions). Add the spice sachet to the pot. Bring the pot to a boil, reduce the heat to simmer. Place the lid slightly askew on the pot so some steam can escape. Simmer for 3 hours until the corned beef from scratch is tender. Add the vegetables to the pot and simmer just until they are tender. Remove the spice sachet and discard. The photo above shows all the pickling spice mixture that clung to the corned beef and vegetables. At this point, I had to strain the liquid several times and pull peppercorn and spices out of the folds of the cabbage, etc., but if you make that spice sachet, you can avoid that hassle. I’ll let Kenji Lopez-Alt explain in his article about Slicing Meat Against The Grain. Suffice to say that slicing in the right direction will do your corned beef from scratch justice and slicing it the other way will be like a poke in your eye. Serve in shallow bowls with vegetables and a bit of the broth spooned over the top. Ta-da. Corned Beef From Scratch. Happy St. Patrick’s Day! 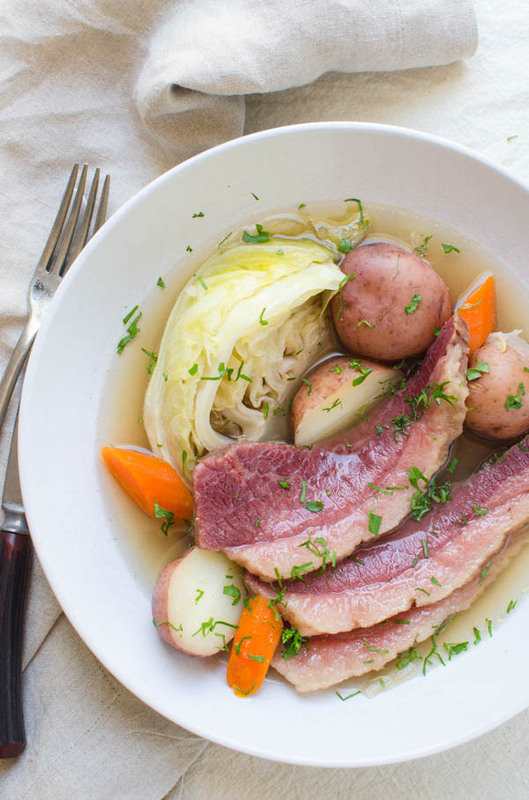 Skip the packages of corned beef and make your own from scratch. You just need some space in your fridge and a little patience. Corned Beef From Scratch will ruin you for the store bought stuff. 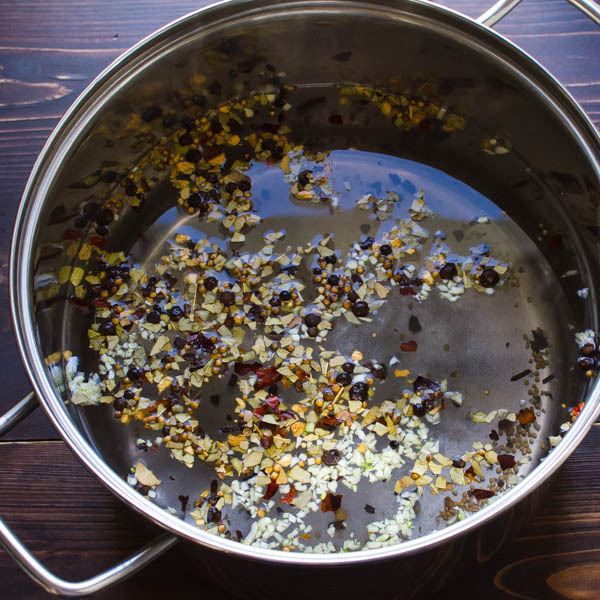 In a large pot, combine all the ingredients for the brine and simmer until the salt and sugar are dissolved. Cool to room temperature and refrigerate several hours until cold. 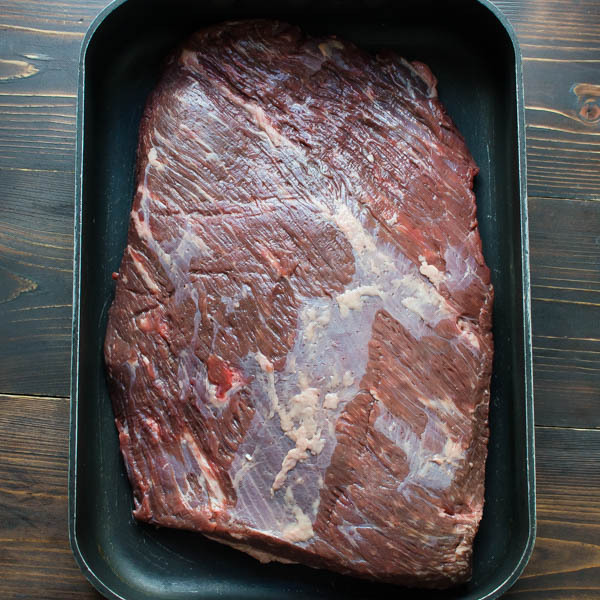 Place the brisket in a pot or receptacle large enough to hold both the brine and the meat. (I purchased an industrial restaurant container with a 12 quart capacity -- and it filled it about half way up). Pour the chilled brine over the meat and refrigerate for 5 days. If the meat isn't completely submerged in the brine, place a plate on top of it to push it into the liquid. Flip the meat every day or so. 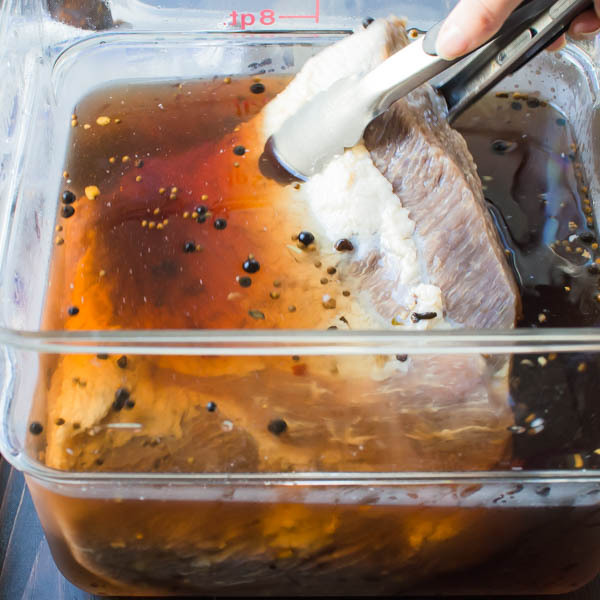 Remove the brisket from the brine and rinse well under cold running water. Discard the brining solution. Place the brisket in a large, heavy pot or dutch oven and cover with cool water. Place the pickling spice in the center of the cheesecloth, bring the ends together in a bundle and secure it tightly with the kitchen string. Add the pickling spice to the pot. Bring the pot just to a boil, reduce heat to a simmer and cover with the lid slightly askew. Cook for 3 hours or until beef is very tender. Remove the pickling spice bundle from the pot and discard. 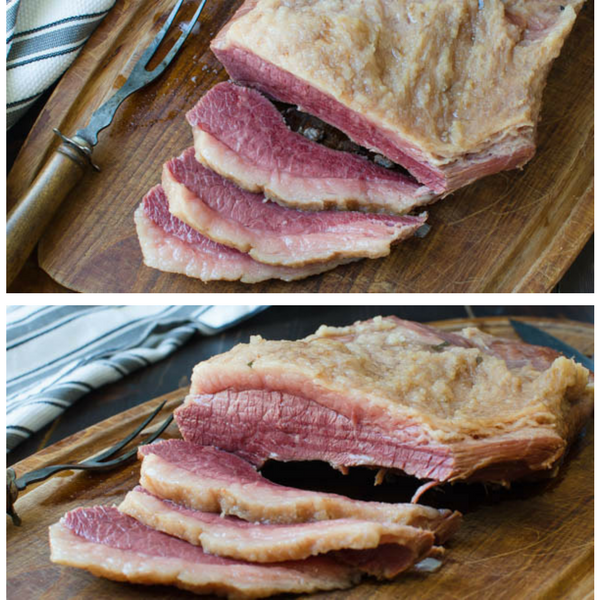 Transfer the corned beef to a cutting board and slice thinly to serve. 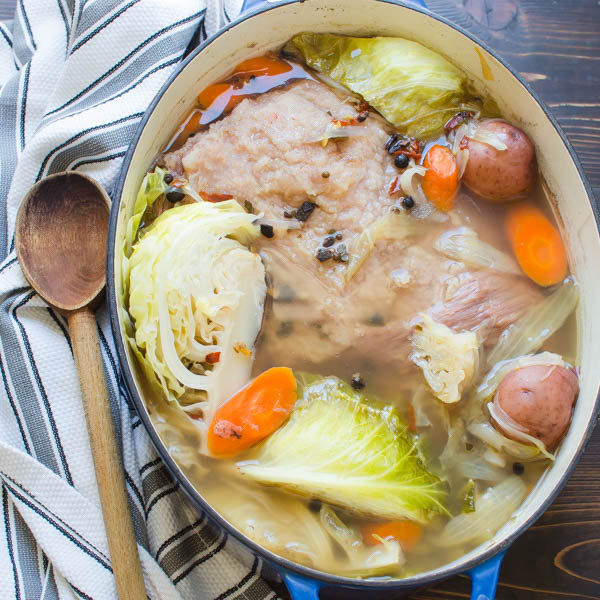 To make the corned beef with cabbage and vegetables -- proceed with cooking the corned beef as described above, but only simmer the meat for 2 hours and 15 minutes -- then add the vegetables to the pot and continue the simmer with the lid tightly secured for an additional 45 minutes or until vegetables are very tender. Remove the pickling spice bundle. Transfer the corned beef to a cutting board and slice thinly. 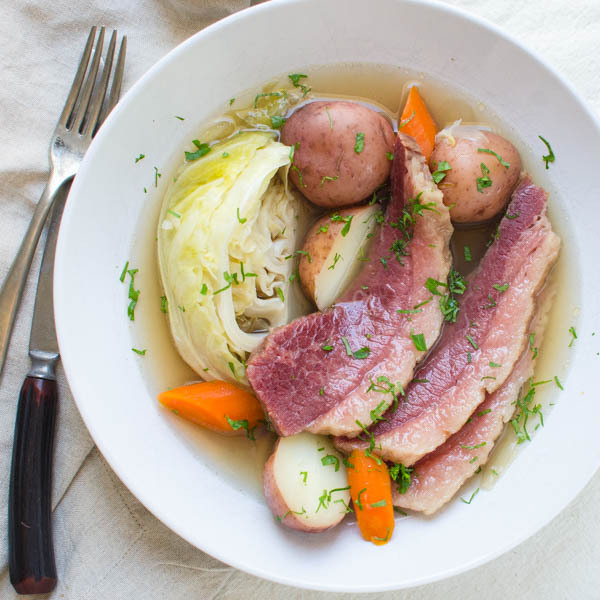 Arrange a few slices of meat in a shallow bowl adding potatoes, carrots and a wedge of cabbage. Spoon the liquid over the beef and vegetables to serve. Pin “Corned Beef From Scratch” For Later! I love corned beef. This is such a great recipe. 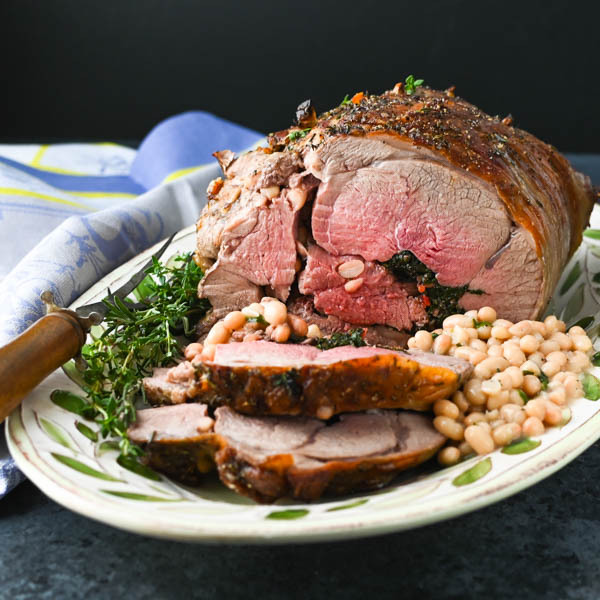 Perfect to feed a crowd, and great to celebrate St. Paddy’s Day. Seriously I would eat this all year long. Great sandwiches with leftovers too. I love how easy it is to turn brisket into corned beef!! And I didn’t know curing salt wasn’t just salt!!! As a scientist I should know this! Your finished dish looks sensational, I just want to grab a slice of that beef!!! Honestly you are making me hungry and it is almost midnight here!!! Glad you like it, Claire! 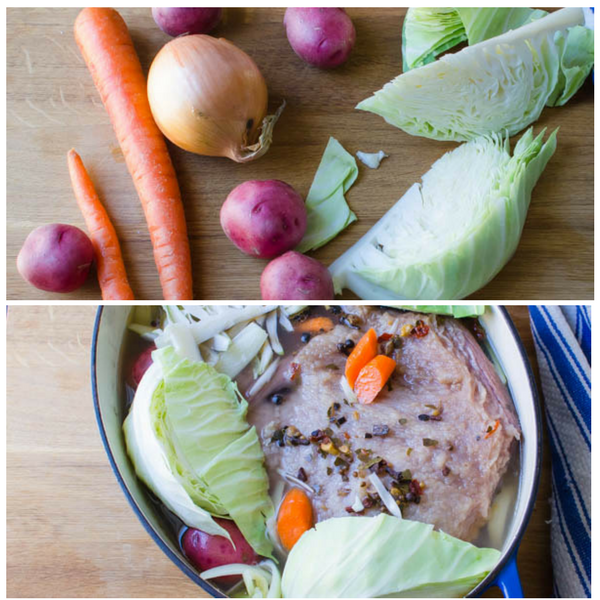 It’s really a simple process — just takes time — and a large receptacle for the beef and brine. This post was a wealth of information Lisa! I learned so much – pink salt = prague powder being chief of them! And the amount of time and love that goes into making corned beef. No wonder people are so possessive of their versions! 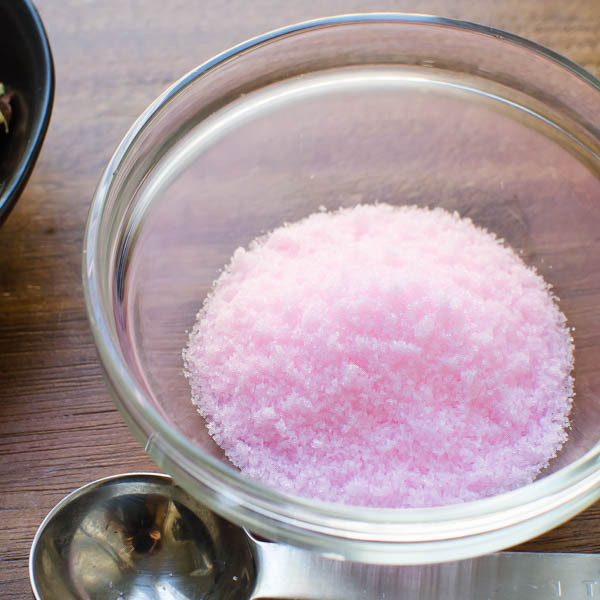 Yes Pink Salt = Prague Powder — that one’s important. This is awesome. I absolutely love corned beef, but am always disappointed that it seems I can get it this time of year. Silly me, I never considered making it from scratch! And this looks so easy! I’m def going to try this!